Panelists begin the discussion in theater #14 at Celebration Cinema North in Grand Rapids. 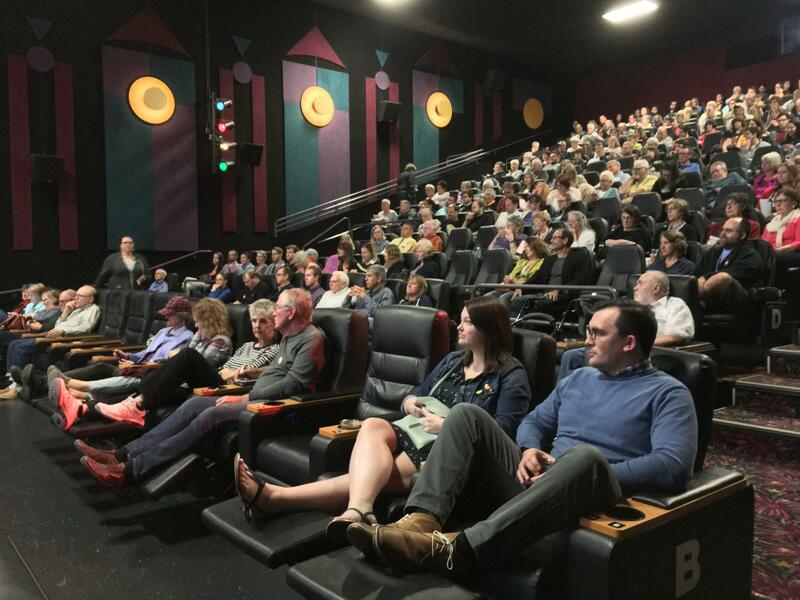 Lessenberry took the stage last night at Celebration Cinema North in Grand Rapids. 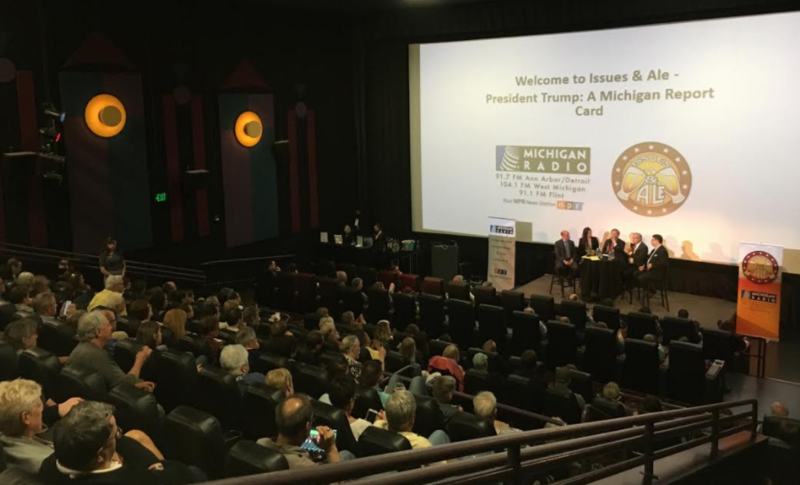 Together, they worked to determine how the Trump administration has impacted people in Michigan up to this point. “I think [President Trump] is in the same position now that he was on the election,” Hagerstrom said. While he conceded the White House has seen its fair share of drama throughout these 120 days, Hagerstrom wasn’t bothered by it. Audience members directed the night's conversation with questions about topics ranging from immigration and "otherization" to public education. Hagerstom said Trump is fulfilling his campaign promises. Namely, he said, Trump has taken the United States out of the Trans Pacific Partnership (TPP), he’s going to renegotiate the North American Free Trade Agreement (NAFTA), and he’s working to repeal the Affordable Care Act (ACA or Obamacare). In terms of Michigan-specific points of concern, Bucholz named Great Lakes programs on the chopping block and what he called the administration's rollback of public education. There’s no denying the night’s conversation was contentious. And Bucholz said the nature of the conversation going on in this country is part of the problem. “I think one of the problems we have … is civility. I’m not interested in the crowd boos or the reactions. I think that everybody has a point to make and they’re all valid,” he said. Listen to the night’s full conversation above. You’ll hear talk about the Trump administration’s education policies and immigration policies. You’ll also hear discussion about how the news media has covered President Trump and about panelists’ outlook on the midterm elections.